Greetings, East Kingdom Rapier Marshals. -Who warranted you and when. Local Marshals, please obtain this information from your area Marshals at Large. Emails for each region are listed below:. Unto the Kingdom of the East do I, Don Frasier MacLeod send greetings. I am pleased to announce that the new Southern Regional Rapier Deputy will be Baroness Engracia de Madrigal. Again, I would like to thank Don Griffith Davion for his service in this position. Please join me in welcoming Baroness Engracia to her new position, and I encourage all of you to help make her transition a smooth one. War is once again behind us, and though the fertile mantle of the East Kingdom will soon be covered in snow, it’s the perfect time for its fencers, soldiers, and duelists to bare polished steel and mind their deadly art. Another war is always around the bend, and preparation is paramount to victory! To keep the East Kingdom rapier army’s skills sharp and improve unit cohesion, the Barony of Carolingia will be hosting an EK Regional Fencing Practice on Sunday, January 4th. At the practice, fencers will get a chance to work on their melee skills both with their household/local fencing unit, and with the kingdom army at large. There’ll also be time for single bouting, and a tournament taking place is also a strong possibility. There will also be a class or two for fencers to learn from. 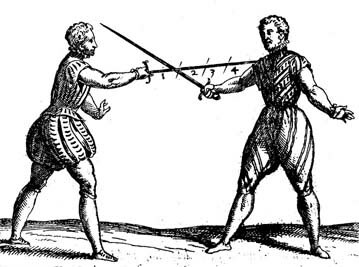 Parties interested in teaching a fencing class (be it for single or melee), should contact Lord Remy Delemontagne de Gascogne, Captain of the Carolingian Caliver Company with their class title and agenda. Other notes: Street parking is free on Sundays and folks can park in the Harvard Vanguard parking lot across the street. Please wear non-marking footwear. Because this is a practice, non-authorized fencers are allowed to participate. Can’t make it to the EK Regional Rapier Practice? Have no fear! Carolingia hosts a monthly melee practice at the War Memorial, open to all who want to work on their melee techniques. Here are the upcoming melee practice dates (more dates added monthly). Any questions, thoughts, or concerns should be directed to Lord Remy. As many of you know, I stepped up into the Kingdom Rapier Marshal position at Crown Tournament. One of the priorities of my early tenure in this position is to find replacements for some of my Regional Marshals. To that end I would like to officially put out the call for resumes from anyone interested in taking on the position of Central Regional Deputy Rapier Marshal. As the previous Deputy, Don Donovan, is now my Kingdom Deputy, I need to fill the void left by his departure for this new position. Anyone interested in taking on this position please send me your SCA resume to the Kingdom Rapier Marshal e-mail listed in Pikestaff. I will be accepting resumes until Thursday, November 27th, at which time I will close the window and review the resumes I have received up to that point. I look forward to hearing from any of you who wish to take this position on. Don Frasier MacLeod in a photo from the Queen’s fashion challenge at Birka earlier this year. Sir Osgkar of the Wood, Earl Marshal of the East has announced that Don Fraiser MacLeod has been chosen to succeed Don Caine Ramsey as East Kingdom Marshal of Fence. Sir Oskar described the choice as difficult, but expressed his confidence that Don Frasier was the correct choice to continue to guide the rapier community in the East and help keep it dynamic and growing. The transition in the office will occur at Crown Tourney in Stonemarche on November 1st. Don Caine has expressed his gratitude to the rapier community at large for their support over the past three years. “It has been my sincerest joy and pleasure to serve you all” he said in an email. Greetings all! – Upon this coming 18th of October, the people of the Canton of Black Icorndall in the Barony of Bhakail invite you to join Their Majesties Edward III and Thyra II at a grand tourney highlighting the skills of the East in the arts of defence. Their Champions, Don Donovan Shinnock and Don Thomas of Effingham, will oversee the tourney as Their Majesties attend to the selection of the next King’s and Queen’s Rapier Champions. Children are welcome but we ask you to please supervise your children at all times. We are planning to have children’s activities. More details to follow. No animals are allowed on site except Service Animals as defined by the Americans with Disabilities Act (guide dogs, signal dogs, or other animals individually trained to provide assistance to an individual with a disability). Site fees: $10 for adults ($12 at door). Dayboard included. Please add the $5 Non-Member Surcharge if you are not a member of the SCA. $8 for children 6-17 ($10 at door). Free for children under 5. Send reservations to: Please send the following information with your reservation: Modern and SCA names for all persons included in the reservation, proof of membership for all members included in the reservation (photocopy of membership card or copy of cover of recent Pikestaff cover with the members name is acceptable), contact information, and check or money order made out to “SCA PA, Inc., Canton of Black Icorndall”. Honourable Lord Muin maqq Minain (Donald Downie) 404 Blakeley Rd. Autocrat: Master Rowen Cloteworthy, (Rowen Stuffer), 113 E. Third St.
– From the North – Take I-276 (PA Turnpike) to I-476 South (Mid-County Expressway). Take I-476 South to Exit 3 (Baltimore Pike). Make a right at the bottom of the ramp towards Media. Take East Baltimore Pike 1.3 miles. ** At the traffic light at Beatty Road (Acme shopping center on far right corner, PNC Bank on near left corner) turn left onto Beatty Road. Go one block to a stop sign and make a left onto N. Providence Road / PA-252 South. Go 0.3 miles and turn left onto Plush Mill Road. Go 0.1 miles; Stage One will be on your left. – From the South – Take I-95 to I-476 North. Take I-476 North to Exit 3 (Baltimore Pike). Make a left at the bottom of the ramp towards Media. Take East Baltimore Pike 1.4 miles. Follow from ** above. The site is also located near public transportation from Philadelphia, within a mile of both the Wallingford Station of the SEPTA Media/Elwyn Regional Rail Line from 30th Street Station and the Media / Providence Road stop on the 101 Trolley from 69th Street Terminal. We are working to have a shuttle service available from those stops and will have more details as soon as we can. Join the Barony of Carolingia (northeastern Massachusetts) for a day full of activities for all ages on May 3rd. Spend the day trying out all the Society has to offer for our younger members, from youth combat to classes on all manners of arts and sciences, from dancing and music to thrown weapons. There will be equestrian activities, youth fencing, archery, and much more. Come meet other parents with children around your child’s age with parent and child meet and greets, bring the garb your children have outgrown to swap with other parents, and enjoy a sumptious dayboard of kid-friendly treats prepared by Ulf and Justinius, under the supervision of Fergus Redmeade. Teens and Tweens! Come learn to make cheese, help out in the kitchen, or work gate. Have a skill you know how to do? Come teach it to younger kids. Bring the Arts and Sciences project you are working on to display, learn a new skill in one of our classes or pick up a new martial art. If you would like to teach a class, please contact Baroness Leonete. You do not need a background check or specific experience teaching children in order to teach, and we are happy to help you adapt your class for the younger set. We are especially looking for those under 18 willing to teach. More information can be found if you click here event announcement or on the Facebook Event Page. While the field battle is the dramatic centerpiece of Pennsic, the woods battles are possibly more loved by the combatants themselves. Many appreciate the additional challenges that combat without sight lines bring. Strategies must be drawn up differently, tactics must be executed with precision, and moments of heroic combat take place continually throughout the battle. In a dramatic day of combat both the heavy and rapier armies took to the woods of Pennsic for a series of war point battles. Our sources tell us that the East won all woods battle war points for both the heavy and rapier combat. Reports are coming in that in many battles this year at Pennsic the Eastern side is fielding a significantly larger force than the Midrealm side. This was reportedly the case in these woods battles. The East Kingdom Gazette welcomes anyone at Pennsic to send in reports and photos “from the field”. Email reports and news items to us at eastkingdomgazette@gmail.com. Please read our submission guidelines so that the editors will have everything that they need to make your news known.